Ubuntu (Latest Stable Version : Ubuntu 11.04 (Natty Narwhal) ) is one of the most popular Linux distribution on this planet while Java, the most popular programming language (Platform independent features makes Java Great! and superior to any other programming language, for building web and Desktop Applications). Due to a number of free( and of course they’re good) tools, compilers and other options Ubuntu has become the No. 1 choice, as a development platform, among the Java Developers (specifically young programmers). If you are just a common user then you need only JRE (Java Runtime Environment) to execute java programs but If are going to write java programs or develop Apps then you need to install Java Development Kit (JDK, complete suite for Java Developers) along with some IDE like Eclipse or Netbeans (Not really necessary for absolute beginners). A lot of JDK’s are available, so if you have programmed before then choose the one you like, but on the other hand, try open-jdk-6, an open source Java Development Kit (contains Javac, an open source Java compiler and ). 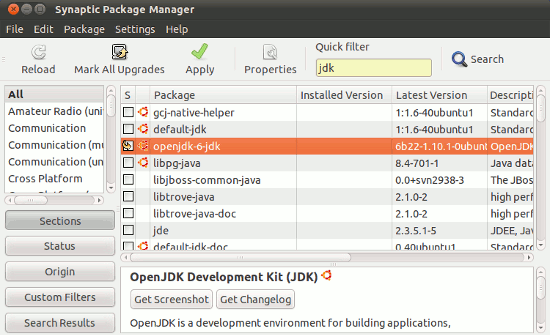 This post will explain – about installation procedure of Open-JDK on a freshly installed Ubuntu 11.04. #1 : Open Synaptic Package Manager (and click on update button, it’s not necessary but it’s usually a good practice because in this way you will get the latest details about the packages), and search for ‘JDK’ or ‘open jdk’ in the quick search bar. #2 : Then select the package for installation ( by checking the small square box) and click on ok, if it asks for dependencies. #3 : Now, click on ‘Apply’ button to begin the installation procedure…and wait for the installation to complete. Open Terminal and enter the following command(s), then enter your ubuntu login password followed by ‘y’ when prompted for yes/no. It actually not work.Please attach more screenshot. For some reasons Ubuntu Software Center was unable to install software after I installed some updates. So I was not able to install openjdk. Your post helped. Thanks. wherre can i find it?